Close This website uses its own and third party 'cookies' to offer you a better experience and service. By browsing or using our services, You accept the use we make of them. 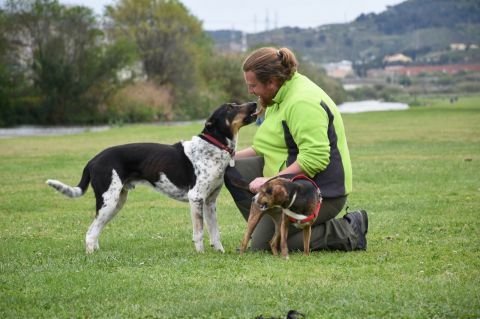 In CANMIGOS we know our dogs’ potential, we know the basic and advanced coexistence needs that we require and desire from them, and we have training protocols and methods that maximize happiness in people and dogs when both coordinate. Moreover, with our intensive work protocols the improvements and results arrive in no time. • With a correct management of emotions by the dog, anticipating a potential fear or aggression. Every behaviour problem can be solved or improved: even the scary separation anxiety disorder when the dog is left home alone. Sometimes dogs behave in ways that lead to problems in our daily life together, and for reasons that the families usually do not know. In CANMIGOS, we work systematically on the root cause of those behaviours with our own personalized protocols. Like this, we achieve an easy and healthy life together between people and dogs. Anxiety is an emotion that affects 20% of dogs when they are left alone at home. With the work protocol of separation anxiety of CANMIGOS we will get your dog, not only can stay alone at home for a few hours without causing inconvenience to neighbors or material damage, but also enjoy your time autonomously. Private dog training at your home gives you the comfort of having the dog trainer seeing and working with your dog in his daily environment. 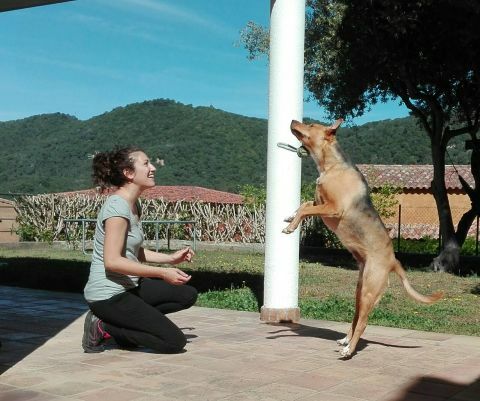 Moreover, CANMIGOS develops a working protocol that leads to quicker improvements in the dog’s behaviour, at the same time that it does not require the guide’s time during all the training, unless you want it. Puppies live a stage where they are able to learn how to manage the different stimuli that will be found throughout their life. During the course of puppies in CANMIGOS we work these points in a fun way to build your bond with the puppy, to prevent future problems and to grow as a balanced adult dog. Obedience with our dog should be directed to build a healthy coexistence and a happy day to day. 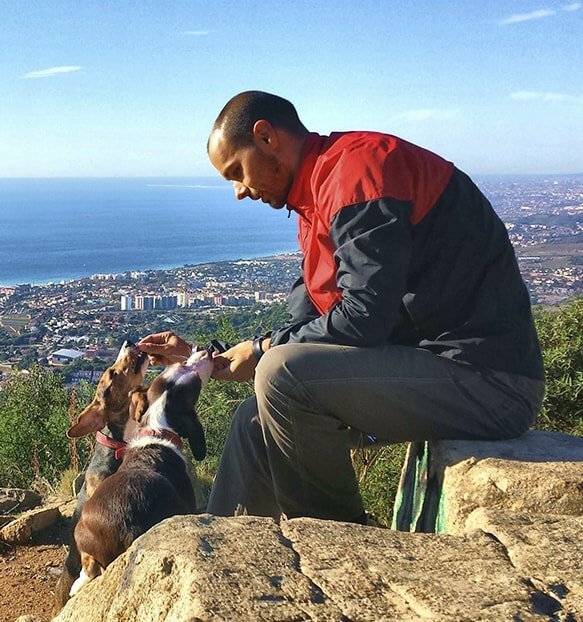 Therefore, in CANMIGOS we face the obedience course as a training to be able to pass a test of Canine Life and Social Skills (CLASS) and demonstrate that with our dog we can go anywhere. Some adult dogs, due to bad experiences (some without realizing it) or experiences they have had, show reactivity in certain situations towards other dogs: they become aggressive and they throw themselves at other dogs. In the classes of the CANMIGOS Canine Social School we help you tolerate and manage these situations so that the family can be calmer. The best way to make a proper contact with the sport of canicross with your dog is thanks to the CANMIGOS Canicross Initiation course. A course designed to introduce you to this sport knowing everything you need to know to avoid mistakes, as well as to give you the tools necessary for both you and your dog to enjoy the workouts. Both teen and adult dogs can help a healthy and stable life, while improving our bond with them, working with people and dogs, use of smell, problem solving, proprioception and balanced play . With the classes of Socialization and Development of CANMIGOS you will have the ideal situation to do it. At CANMIGOS we offer on request specific courses on specific subjects: course of games of smell, course of dogs truferos and / or detection of substances, course of emotional management of fears, course of emotional management of aggressions, and others. The education of children and teenagers is the basis for a future society that happily coexists with dogs respecting their species, preventing problems or social conflicts such as those that occur nowadays. Contact us and we will help you at all times! At CANMIGOS we offer our canine education services in the provinces of Barcelona and Girona. Fill out the form below and we will call you in less than 24 H.
In both private and home-based training processes, and in group classes, we offer you all our knowledge, experience, innovative protocols and tools so that the person-dog binomial becomes something more than the mere sum of the parts. Because pride and happiness with your dog can be a reality.